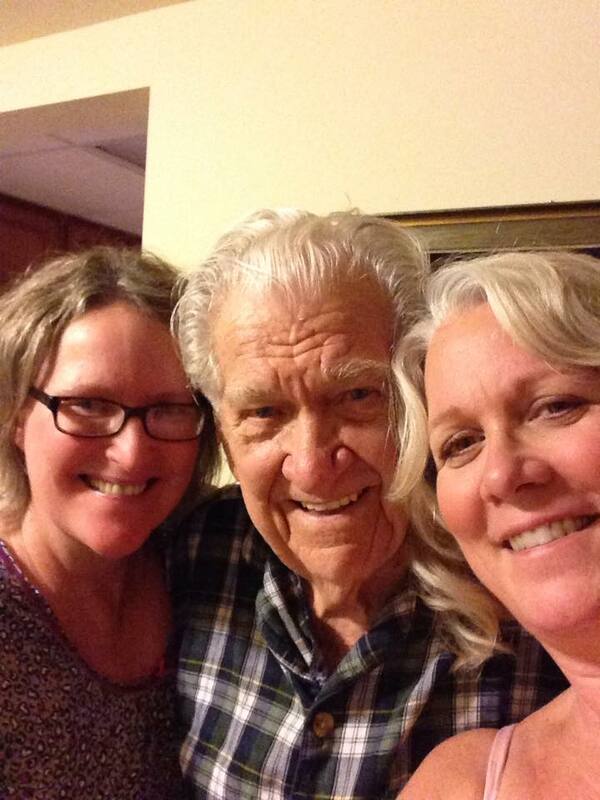 True Tales from the Old Folks Place…People and Conversations…We’ll See You Soon, Daddio. On the drive from the midwest, we say Chicago, though we don’t live there, to the Jersey Shore, we hit every kind of weather you can experience in winter. Sunny but with strong winds, fighting to keep the car on the road, to sleet, ice, snow and finally thick fog and torrential rain. My knuckles were sore from gripping the steering wheel for two days after we pulled into the Old Folks place. A word about the Old Folks Place, I say that, but the image you might conjure up might be different than what it really is. It’s a beautiful apartment building, with wings coming from it for step down units. The apartments are gorgeous, and each one we saw was uniquely decorated, I should do a blog on the stories from their belongings alone. Most moved from larger homes and had to choose what they loved most to bring to their apartments. There were some amazing old pieces, mixed with stylish decor. Some had only antiques. Other couples had twin beds. One apartment had a tiny workshop area. Each place brought the history of its occupants. They get dressed up for supper. Supper is served like a restaurant with several choices, and they sit with different people most nights. The food is so good, twinsie and I love eating there and the company is even better. Our father is handsome and dapper and the ladies all love it when he stops to chat, and the gents love to clap him on the back and have a few words. On the elevator at the Old Folks Place (OFP). Dedunk, thump (rolling their walkers over the elevator door) “Those are the twins..”. “Our apartment, sweetie.” And she plops down on our father’s lap and they snuggle and kiss. “Yes, I suppose we are.” We say, bewildered. In Hedy’s room after we snuck down belongings and filled up her drawers so that she would feel at home. We put photos out and little boxes in her drawers with inexpensive costume jewelry trying to make it exactly how it was in the apartment. Each room in this wing has a large shadow box outside each door. She refused to have anyone put anything in hers when she first arrived, no photos of her and our father. She was mad at him for “locking me in here.” We decided it was time to put photos in her shadow box that included a beautiful black and white photo of her and our father taken just five years ago at twinsie’s daughter’s wedding. “Yes, I don’t know how they got there. Your father must have brought them. Here I am with my mother and father and sister. But all I really care about his this one.” She cupped her hands around the large B&W photo of her and our dad. “But, why am I here, I suppose that’s normal for people to say here, but look, I’m healthy! Unless it’s here?” (she said, pointing to her temple). Now, alcohol is prohibited in this building, but there are a lot of wine and liquor bottles in the recycle bin, and one of the ladies at the table is a faithful Baptist, and she doesn’t like such talk. But she’s good natured with the ribbing, and we all laugh. A blizzard has come and gone, our dad is on the mend. He’s got a new wireless Bose that twinsie bought, and he listens to Tchaikovsky, Chopin, Beethoven. And he can actually hear that beautiful music because we made him get new hearing aids. Twinsie has sat for hours continuing his iPad education started by our big sissy who was there over Thanksgiving. We bought him a new comforter and sheets, a Kuerig coffee maker, a wireless printer, and have put out his beloved things that come from his past, mingled with his favorites of Hedy’s. The lights are just so, his books lined up on shelves, his papers just the way he likes them. And suddenly it’s time for us to go. No goodbyes, we hate them. Just “we will see you soon!” We all cry, we hug and cry some more. It’s the night before we are to leave and I’ve already come down with his flu, so we want to get started early just in case we hit bad weather again. So, we are saying, “See you soon. I love you so much, Daddio. What would I have done without my twinsies?…” And we wonder, truly, what we would do without him. We’ll see you soon, Daddio. < True Tales from the Old Folks Place Part II. What is lost in the mind, can always be found in the heart. I saw this post in my reader the other day, but I didn’t have time to read it. I went to read it today and some how I was no longer following you! Why are we having trouble finding each other?? Anyway I’m back and I loved this sad but funny but lovely post. You twinsies are so gracious. That Hedy is nuts about your dad! Oh, I don’t like that we are missing each other! I haven’t posted because of the darn flu that I from the old folks, it messed with my head. All better now. We need to remedy this issue with us not seeing one another!!! My mom lives in a seniors’ apartment building with a communal dining room where they have lunch and dinner each day, so they all know each other and have a bit of information about various family members. When I go to visit, people point at me and say, “she’s the one from ATLANTA”, like it’s another planet. 🙂 Like you, I won’t say ‘goodbye’, just ‘see you soon’. It’s amazing, isn’t it? Oh, we have so much fun with our Daddio and his friends. It’s been gratifying being with Hedy. We know that being with them is such a blessing. Thanks for stopping in.